Mega Zygarde Shield in game: 40 Who? Important notice! Pokemon Mega Zygarde Shield is a fictional character of humans. Zygarde (Japanese: ???? Zygarde) is a dual-type Dragon/Ground Legendary Pokémon introduced in Generation VI. Along with these Formes are two basic components of Zygarde: Zygarde Cores, which act as the brains of Zygarde, and Zygarde Cells, which compose Zygarde's Formes and cannot think. Neither Zygarde Cores nor Zygarde Cells can use moves or are useful in battles by themselves. Both of these components were introduced in Pokémon Sun and Moon. They can be collected using the Zygarde Cube. 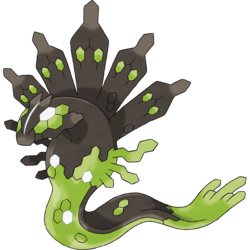 Zygarde 50% Forme has a serpentine body with green and black markings. Most of its back is black, while the underbelly and the tip of its tail are green. Its eyes are comprised of four green hexagons, similar to an insect with compound eyes. Across the back of its neck is a large frill made of five long, flat protrusions. 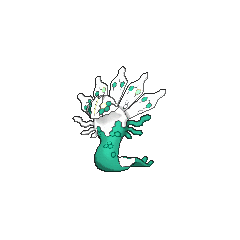 There are three short tendrils on either side of its chest, and its tail ends in five tendrils. It has many small, green hexagon markings on its body that can glow. 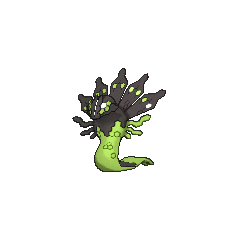 This form of Zygarde is thought to monitor those who destroy the ecosystem from deep with its cave. Should the region's ecosystem fall into disarray, it will appear and reveal its power. 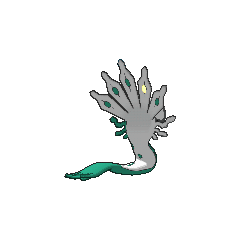 Zygarde Core is the brain of Zygarde, and has a small and leafy-green gelatinous body comprised of a large, round head, a moderately sized body, and a thin, hook-shaped bottom section that may be a tail. Its head is rounded except for a protruding, beak-shaped area at the bottom front. Within its head is a single, oval eye that has a smaller, oval pupil within it. Beside this eye is another white, semi-elliptic shape, possibly a second eye. Within its midsection is a nearly regular, red hexagon. Zygarde Cells make up every other part of Zygarde, and appears very similar to the Zygarde Core. Unlike the Core, it is flat, has a green pupil, and has a darker green, more elongated hexagon within its midsection. Unlike the Cores' hook-like bottom section, the Cells have a long and more noticeably tail-like back-end. Zygarde is a major target of Team Flare in the anime. Zygarde Cells and one of its Cores made their anime debuts in Mega Evolution Special IV. Thanks to the help of Mairin's Chespin, Chespie, the Core managed to escape Lysandre Labs, and came across Ash and his friends in From A to Z!. Bonnie was immediately taken with the unidentified Pokémon, and nicknamed it "Squishy". It traveled in Bonnie's bag, alongside Dedenne. Squishy later transformed into 10% Forme after being separated from Bonnie and the others to defend itself against Bryony and her subordinates; Squishy, however, eventually returned to travel with Bonnie in A Cellular Connection!. In Volcanion and the Mechanical Marvel, it first transformed into 10% Forme when battling Alva's Mega Evolution Pokémon Army. Later in the movie, when Alva used his laser weapon onto the Azoth Kingdom, it transformed into Complete Forme to protect the kingdom. Another Zygarde appeared in The Legend of X, Y, and Z! during a flashback in its 50% Forme. Zygarde Complete Forme made its anime debut in Dream a Little Dream from Me! in a dream. Zygarde debuts in the X & Y chapter. It was first mentioned by Blue, who aimed to find it in order to stop the endless battle between Xerneas and Yveltal. It appeared in person at Anistar City, where it was sought after by Essentia, who aimed to capture it for Team Flare. When X and Y battle Essentia in order to retrieve Y's stolen Xerxer, Zygarde appeared before them and attacked before Essentia manages to successfully capture it. 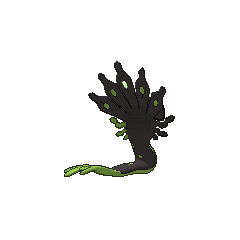 Zygarde is later used by Essentia to battle against X Blue and Blaine. After Emma is freed from Lysandre's control, she was about to order Zygarde to attack him but he manages to take its Poké Ball making it fully under his control. Zygarde is later used to fight against X's Mega Evolved team, but as the battle progresses Emma notices green blobs falling off of it. At that moment, Xerneas and Yveltal are returning into their dormant forms, causing it to disintegrate, and X hits it with a combined attack from his team. This resulted in Zygarde exploding into millions of green blobs, and Lysandre begins to fall. Soon after the battle ended, Blue and Blaine visited Sycamore and mentioned to him about seeing a little green silhouette after Zygarde disintegrated into the blobs. Sycamore reveals to them that similar green silhouettes, which he dubs Zygarde Cells, have been spotted in a far away region as well, and sends Dexio and Sina to investigate them in Alola. One of these moves can be learned via Zygarde Cube by collecting the 5 corresponding Zygarde Cores. Three of them, however, have the same type, base power, accuracy and PP and only differ in additional effects. 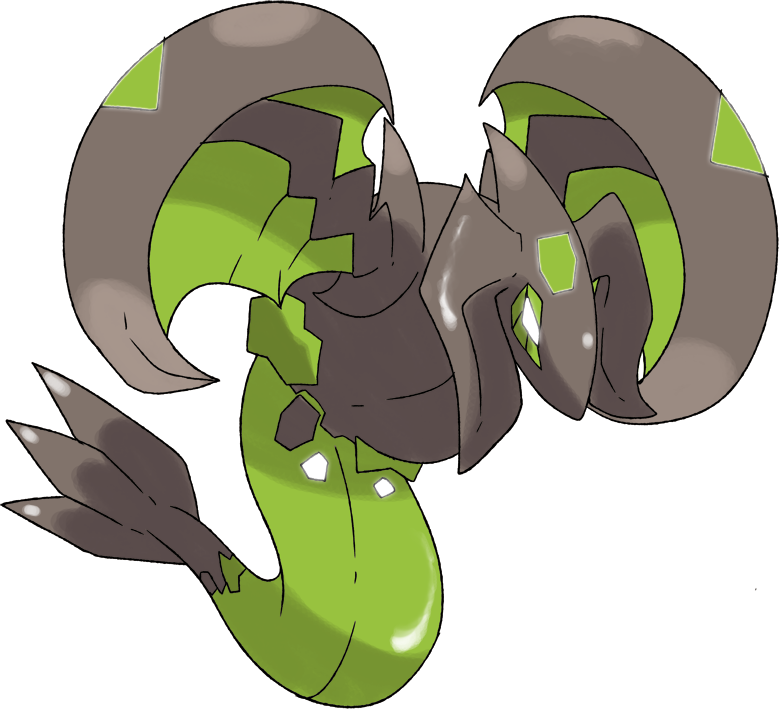 Zygarde 50% Forme's appearance is based on a serpent in the shape of the letter Z. It may also draw inspiration from Jörmungandr, a sea serpent that encircles the earth, and Níðhöggr, a dragon that gnaws at the roots of Yggdrasill, the world tree. Zygarde Complete Forme may be based on Hel, the ruler of Helheim, the realm of the dead in Nordic myth. The colors on Complete Forme's chest match the colors of the real-world flag of France, the country which inspired the region of Kalos, as well as the main colors of Xerneas and Yveltal, the version mascots of X and Y.
Zygarde comes from the letter Z. It may be derived from ζυγωτ?ς zygotos (Greek for joined), zygote, garde (French for guard), midgard (Old Norse: Miðgarðr), or Sigurd.